Being a bike is a thankless job these days. Even the most successful models are susceptible to the industry’s rapid march of change, and for 2017, Trek’s Remedy 29–a widely praised bike–has been tossed aside. 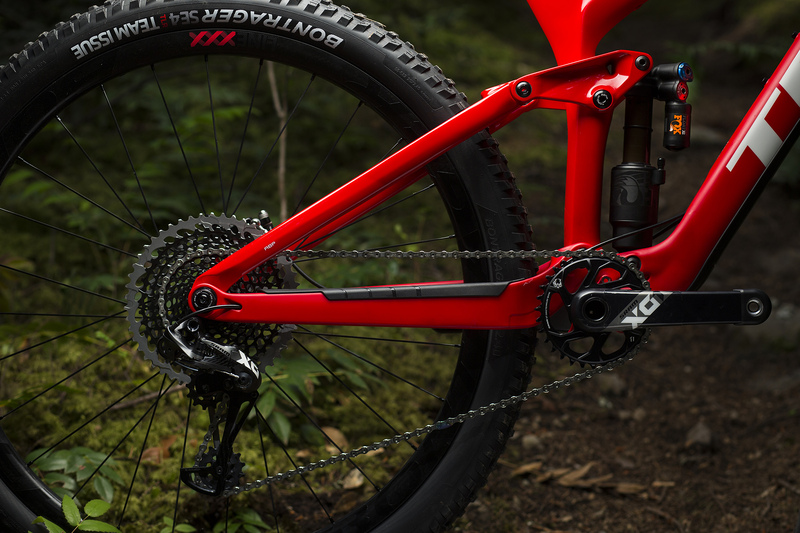 You could say that the Remedy 29 was laid off due to a redundancy, since Trek’s revamped Fuel EX 29 now sports basically identical numbers to the Remedy when its adjustable geometry is in the slack position. Factor in a new, big-wheeled, long-travel Slash 29, and the redundancy becomes enough to make any corporate bean counter see red. One considered too flexy for hard riding, 29ers are now gaining trust among aggressive riders, and Trek’s claim that the Slash 29 is the stiffest non-DH bike they’ve ever made might win over a few more. It’s been a good year for lovers of long-travel 29ers, with new options from brands like Yeti, Evil and Niner, and the Slash joins the ranks of the biggest big-wheeled bikes money can buy, with 150 millimeters of real-wheel travel and a 160 millimeter fork up front. Flipping the Mino link into ‘Low’ will slacken the Slash’s head angle from 65.6 to 65.1 degrees, and adjust the seat tube angle from 74.1 to 73.6 degrees. The bottom bracket also drops from 35.2 to 34.5 centimeters, the reach shrinks and the chainstays lengthen ever so slightly from 433 millimeters to 434. 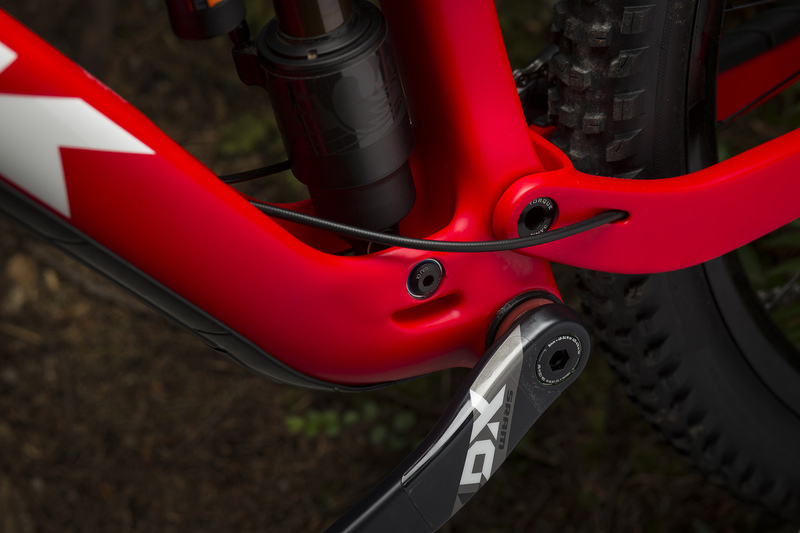 Take a close look at the Slash’s linkage and you might notice that it forgoes Trek’s Full Floater design, in which the bottom of the shock attaches to a mounting point on the chainstay. With two variable mounting points, this design allows for more control over the system’s leverage throughout the rear wheel’s travel. However, Trek says that shocks have evolved to the point where they offer the performance benefits that its engineers sought to achieve with Full Floater, and that mounting the shock directly to the Slash’s downtube opened up real estate for a stronger, stiffer front triangle and rear end while making room for larger shocks like the Fox X2. Just like the newly released 2017 Fuel EX and Remedy models, the Slash has what Trek calls its ‘Straight Shot’ downtube, which removes the bend at the headtube junction. This is apparently where the bike gets its DH-bike-level lateral stiffness. In order to protect the downtube from the fork crown, the Remedy requires Trek’s knock-block steering limiter. 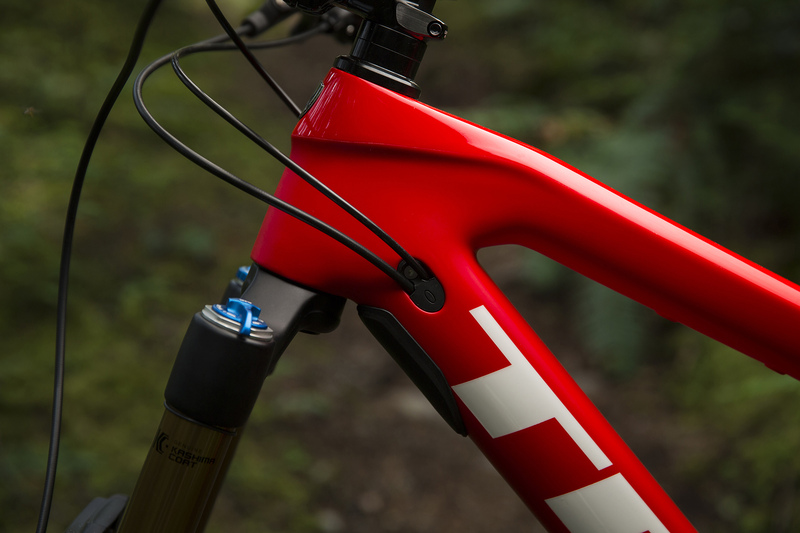 Inspired by enduro athletes putting longer travel forks on the Remedy, Trek is positioning the Slash 29 as a bike focused on the highest level of enduro racing, and as such it is only available in carbon. Two builds will be offered: the 9.8 will retail for $5,500 and come with a travel-adjust RockShox Lyrik RC fork and Super Deluxe shock, Bontrager Line Comp 30 wheels, a SRAM X1 drivetrain and Guide R brakes, and Bontrager’s Line cockpit and dropper post. The $9,000 9.9-level build includes a Fox Factory 36 Talas fork and Float X2 shock, Bontrager Line Elite wheels, SRAM X01 Eagle drivetrain and Guide Ultimate brakes, Bontrager Line Pro cockpit and Drop Line dropper post. The Slash 29 can also be had as a frameset for $3,700, which includes a Fox Float X2 shock, Knock Block headset and Line Pro stem. Completes and the framesets are expected to be available in October.